How Much Sodium Is in an Apple? Potassium is an electrolyte. Electrolytes are responsible for communicating information between various parts of the body. They do their job by passing around electrical charges through which information is relayed. Potassium carries a strong charge and is essential to every biochemical function of the body. Severely dry skin is a symptom of potassium deficiency and shouldn’t be ignored. Hypokalemia is the medical term for potassium deficiency. According to the National Institutes of Health, or NIH, diuretics are the most common cause of deficiency, although certain antibiotics can also cause problems. Because potassium electrolytes reside in water, any illness or activity causing excessive dehydration poses problems. Diarrhea, vomiting and the eating disorder bulimia can all lead to hypokalemia. The NIH also cautions that consuming large amounts of licorice made with glycyrrhetinic acid will deplete potassium. Although glycyrrhetinic acid is no longer used in the United States in making licorice, the acid may be lurking in herbal teas and chewing tobacco. Potassium consumed in the diet exists as a mineral compound. 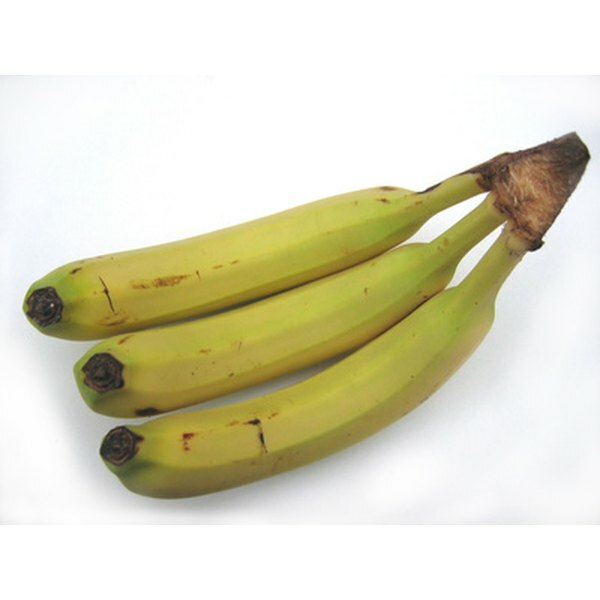 Bananas are perhaps the most widely recognized food that is high in potassium. When you eat a banana and it enters the stomach, the compound is broken down and the pure potassium mineral is released. In the presence of water, the mineral takes on an electrical charge and becomes a potassium ion, or electrolyte. Other foods high in potassium include all meats, potato skins, and broccoli. The Institute of Medicine recommends that adults consume 4,700 milligrams a day of potassium. Xeroderma is the medical term for dry skin and is an alarming symptom when associated with potassium deficiency. Potassium correlates highly with skin hydration and elasticity. If there is not enough potassium in the body, not only will the skin dehydrate, but it will also harden. Dehydration and hardening is not limited to the skin, and when caused by potassium deficiency, it affects all organs of the body, including life-sustaining organs such as the heart, kidney and liver. Potassium is abundant in foods and deficiency as a result of inadequate diet is rare. However, new social behaviors and medications present unexpected challenges. For example, the journal "Critical Care and Resuscitation" reports on an emerging trend in the case study of a patient suffering profound hypokalmia. The patient was taking an ibuprofen and codeine pain reliever while consuming large quantities of a caffeine-containing energy drink. The article advises physicians to be alert to these emerging social trends. What Are the Benefits of Sorrel Fruit?